Newer 3-story log cabin located at the bottom of the Swirley Canyon whitewater run of the South Fork Payette River between Garden Valley and Lowman. You can launch and land rafts and kayaks from the property. Hiking, jeeping, ATV, and mountain bike trails start right from the end of the driveway. Public land adjoins the property and there is abundant fishing, and wildlife viewing opportunities. Fall and winter are incredible for wildlife viewing. Summer is great for viewing birdlife. At night, open the windows and hear the soothing sound of the river. This 2000 sq. ft. log cabin is very cozy. Because of its massive construction, no air conditioning is required to keep cabin cool in the summer. Summer days in Garden Valley start out cold and get warm in the afternoon (good for rafting and kayaking), the cabin stays a constant 72-76 degrees. In the spring and fall, the fireplace is used to supplement the electric forced-air heat. In winter, the fireplace and woodstove (in the walk-out basement) are used to keep the cabin extra-toasty. Come get away from it all one hour from Boise. Amenities include massive windows with views, a Jenn-air style range and fully outfitted kitchen, massive 3-story fireplace, and a full bathroom on each floor. Cabin is roomy for a group of 6-8 people. We bought the property and built the cabin directly on the world famous whitewater river, the South Fork Payette. There is fishing, camping, hunting, mountain biking, jeep trails, ATV trails, etc. There is plenty of undeveloped, non-commercial outdoor recreation to do here. Benefits include access to the river. The birding from the deck is great. We view osprey, eagles, hummingbirds, tanagers, herons, and other birds. You have access to lots and lots of beautiful mountain country with lots of hot springs and other surprises. Crouch is very rustic but does have breakfast, lunch, grocery, and dinner choices. 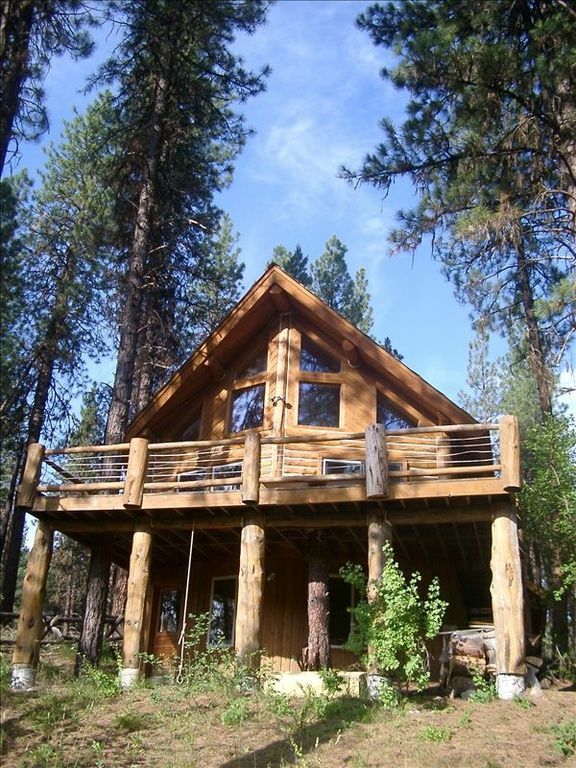 Cabin is on the South Fork of the Payette, a whitewater recreation river. There is electric heat as well as wood stove and wood fireplace. Two car garage. Realistically space to park one big car. There is a great room on main floor with fireplace, a great room downstairs with wood stove. There's a loft area for another children's space. There are basic commodities and maybe the ingredient you forgot to bring. There is no dishwasher but there is a drying rack. There is some basic consumables and maybe some emergency ingredients. Every type of kitchen pot and pan is available. There's a dining table in the main floor great room and it is adjacent to the 4 stool bar. There are a few books (including books about the local area) in game pantry just off kitchen. There is a game cabinet built-in right off kitchen on main floor. There are toys for small children (6-12) distributed in boxes mainly in basement. We have few videos if you don't bring any. Beautiful deck above the river. Quite large with great view and plenty of chairs. There's a table and an additional table in laundry room. Cabin is in a great spot for either putting on water or taking off if you are a knowledgeable kayaker or rafter. Tubing can also be done for short stretches of the river. See owner for details. There are stairs to exit garage, to enter the cabin, and two staircases in the cabin. This cabin was was just as advertised and we had an awesome time in the snow! This venue worked well for us because we had a wedding in Garden valley and needed a place to rest and regroup. A nice place with all the amenities we needed for a relaxing stay at a reasonable price. It has three bathrooms all equipped for bathing and a large hot water heater, and that made it easy for everyone to get ready. The owner was very accommodating and easy to get a hold of, the cabin is close enough to Garden valley or Crouch if you need something, its just a quick trip to town and back. We brought our own groceries and the kitchen was equipped well enough to cook about anything. Overall a nice place to kick up your feet, and enjoy Mother Nature. This was a girls trip & we were very uncomfortable, he also walked into the home unannounced 😕. All of the beds could use a little updating..
Glad you enjoyed the gorgeous view. It is a great spot. Sorry that you didn't enjoy the owner retrieving his raft and storing it after a float of the river in front of cabin. I did ask if I could do this. We didn't hang out any longer than we needed, but I am sorry you didn't enjoy that. Most guests like seeing the owner at the property. I don't remember entering without announcement. Sorry your visit didn't meet your expectations. The toilet flapper valve was fixed as soon as it came to my attention. I wish you would have let me know while you were there. Regarding the deck railing - We post warnings about the outside deck railing so that people will not climb on it. Falling would be injurious. Regarding cleanliness - Our cleaning crew does a consistently good job cleaning all toilets, bedding, floors, etc. We receive very few complaints. I won't guarantee that there will never be a cobweb in this cabin in the woods. Again, if you have complaints about the cabin I actively ask all guests to address them while they are in the cabin, not after if they would like a remedy. I am more than happy to address any complaints while guests are in our cabin. We had a great time, and everything was clean and comfortable. The place was great! We spent most of our time on the beautiful deck. The owner and Honeaway were responsive to any questions we had. The Payette River area near Garden Valley is great for rafting, kayaking, hunting, hiking, mountain biking, ATV, or motorcycle riding. There are trails right out the door from the cabin. Also, kayaking, rafting, paddle boarding can be done right from the cabin.